Fill a bowl with cold water. Cut the leeks in half lengthwise and plunge them in the water, fanning the layers to get rid of any grit. Once they are clean, cut crosswise into 1/4-inch strips. Bring a pot of salted water to a boil and cook the leeks for 3 to 4 minutes, until they are softened but not limp. While they are cooking, whisk together the flour, baking powder, a few grinds of black pepper, salt, and cayenne. Drain the leeks – try to get rid of as much water as possible. Transfer the leeks to a large mixing bowl and add scallions. Add the flour mixture to the leeks and toss to coat. Add the egg and stir until it is incorporated with the mixture. In a large skillet, heat the oil over medium heat. Scoop heaping tablespoons of the batter into the skillet (should be able to do 3-4 fritters at a time). 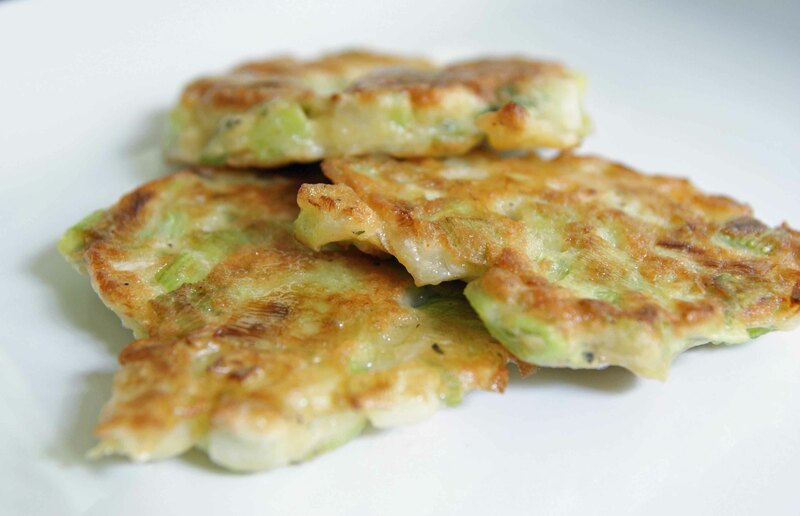 Using a spatula, gently flatten the fritter. Cook for a few minutes, or until it is golden brown. Flip fritters and cook until the other side is golden. Drain on paper towels. Serve fritters immediately and top with a dollop of sour cream (or yogurt) and a little additional lemon zest.